The Wizarding World of Harry Potter may be getting a twin…and perhaps a lot more siblings. Earlier this month Universal Studios President Ron Meyer said in an interview, while panning recent studio failures, said, “Yes” when asked about plans to build additional Harry Potter parks. Well now the Wall Street Journal is reporting that a second Wizarding World of Harry Potter is on the way (paid subscription required to read the whole article) – and the location will be at Universal Studios Hollywood. Not much more details, other than an official announcement may come next week. 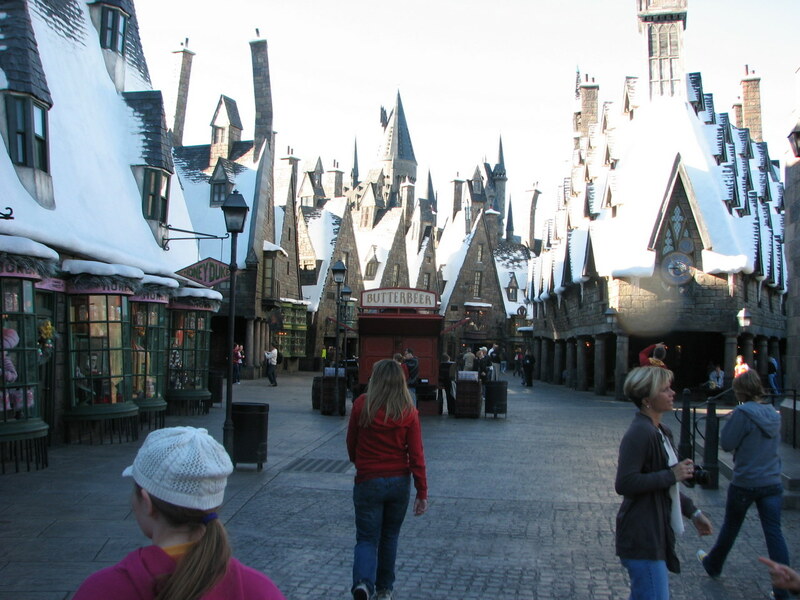 The Wizarding World of Harry Potter was a huge success in Orlando (see a previous trip report here), helping to bolster the flailing Islands of Adventure park. Rumors have gone around about a possible expansion to that area, but with the possibility of money going to the other coast to build fresh there, I wonder if that pay delay any expansion plans. We already knew that the BBC will not produce any more Doctor Who Confidential specials to tie in with future episodes. But an apparently already-filmed Confidential to tie in to the upcoming Christmas episode, “The Doctor, The Widow and the Wardrobe” (which airs at 9pm ET Christmas night on BBC America for those of us on this side of the pond) will also not be shown, despite the fact it already exists. Perhaps it will turn up in someone’s attic in 30 years? Next Sunday will mark the debut of Syfy’s latest fairy tale mini-series, Neverland, which will air in two parts on Sunday, December 4th, and Monday, December 5th, at 9/8c. Unlike the previous mini-series (Tin Man and Alice), it is not a twisted retelling of the story, but actually an origin prequel which explains how Peter became the “boy who never grew up”, how James Hook became a pirate captain who battles Peter, and how they and the Lost Boys found themselves in a place called Neverland where no one grows old. It stars Rhys Ifans as James Hook, Charlie Rowe as Peter Pan, and Anna Friel as pirate captain Elizabeth Bonny, along with Bob Hoskins (reprising his Hook role as Smee), Charles Dance (Dr. Fludd), Q’orianka Kilcher (the Native American princess Aaya), and Keira Knightley (the voice of Tinker Bell). 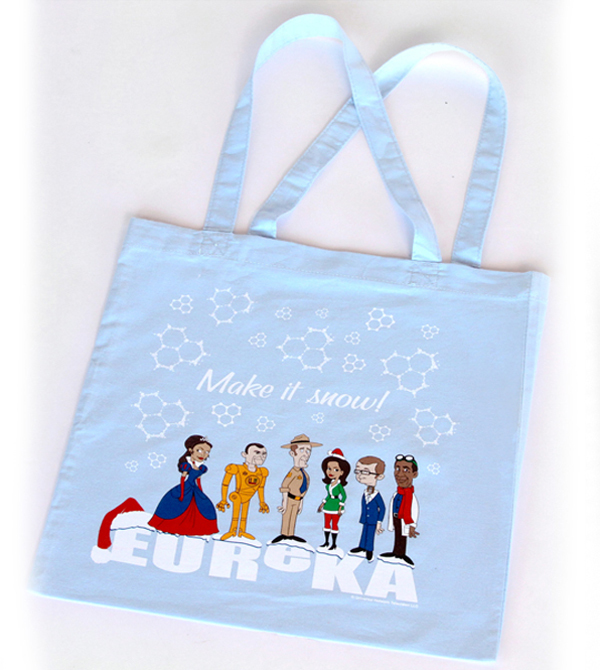 Our friend Ashley Eckstein and her HerUniverse brand has added some new merchandise for the holiday season, including some Cyber Monday deals…including this cute Eureka holiday-themed tote bag, featuring the characters in one of the many animated forms they take in the upcoming holiday episode, airing next Tuesday, December 6th. Other new items include other Syfy products, such as a Battlestar Galactica pajama set, a Viper wings necklace, a Warehouse 13 burnout T-shirt, and a Sharktopus T-shirt (including a first-ever Mens version). On the Star Wars side, there is a “Daddy Issues” thermal hoodie and a Jedi charm. Plus, there are a limited number of Cylon “Toaster” necklaces (previously a convention exclusive), and also right now with any purchase you can get a free holiday Yoda pin! Sounds like there were still production reasons at work. The Thunder Child is very proud to announce that James H. (Jim) Burns has joined the writing staff of The Thunder Child. Jim was one of the first writers for Starlog magazine, way back in the 1970s, a contributing editor to Fantastic Films, and contributed articles to Cinefantastique, Starburst and Twilight Zone magazines. And now he’s writing for us. First up, a trilogy of articles on King Kong – the original. First he reminisces about him, his father, and the tradition – long before today’s satellite TV, of watching King Kong every Thanksgiving. Part 2 is his reminisces of Chris Steinbrunner (author of The Films of Sherlock Holmes, Detectionary, and Cinema of the Fantastic). And Part 3 is a special treat, entitled, Meanwhile, Back at the Empire State Building. I don’t want to give that away so check it out for yourself. Start out at KIng Kong in the City. Note: “Chimera” has a special airing early this week – Tuesday, November 29th at 10/9c, as well as it’s normal Friday slot. Magnus and Tesla are transported to a virtual Sanctuary. The virtual Sanctuary looks exactly like the real Sanctuary which initially causes them confusion as to whether they were transported or not. They come to realize that the computer is using their conscience to build the digital cloud around them as well as what it is in its own database. While they are discussing this, something rushes past them and disappears. Brushing off the disturbance, the two get to the task at hand and decide to start their search in Henry’s lab. They call the elevator and luckily they look before stepping in as there is nothing but a big hole where the elevator should be. Catch an all new episode of Sanctuary tomorrow, November 29th at 10/9c! Just had to say, that if you have any recollection at all of The Muppet Show, you need, and I mean NEED, to see The Muppets. The movie contains everything that made the Muppets great – silliness, seriousness, great songs, great cameos…and a story line that is a fictionalized tale of where the Muppets have been all this time, yet hits at reasons, valid or not, that we really haven’t seen much of the franchise. It also doesn’t require much prior knowledge of the show. My own kids, who have never really seen the original show but are somewhat familiar with the characters through their movies, loved the movie, laughing and dancing and even signing. In the car ride home they were singing the theme song and “Mahna mahna”. We can only hope that this reboot of sorts sees a resurgence in the Muppets so that we may see a whole lot more of them. Paramount has slated the long-awaited Star Trek sequel for a May 17th, 2013 release date, according to Deadline. The sequel, currently being co-written by directory J.J. Abrams, Damon Lindelof, Alex Kurtzman and Roberto Orci, will also be made in 3D. Earlier today, J.J. confirmed that he was looking for Benicio del Toro to have a role as a villain. Nothing has been revealed about what the role is, but speculation among the fanbase is that it could be Khan Noonian Singh. Here is another trailer for the upcoming Peter Pan origin story Neverland, starring Rhys Ifans, Bob Hoskins, Kiera Knightley and Charlie Rowe. Neverland airs on Syfy on December 4th and 5th at 9/8c – expect a review soon!